Climate change is a serious threat that is already having a major impact in Hawaii, and there are no signs that the threats and impacts will go away. In fact, an overwhelming percentage of scientists predict they will worsen. The Nature Conservancy (TNC), NOAA National Centers for Coastal Ocean Science (NCOOS), and South Kohala Coastal Partnership (SKCP) invited various partners who are stewards of South Kohala to discuss climate change threats, impacts, and solutions for 3 days at Anna’s Ranch in Waimea from January 23-25. 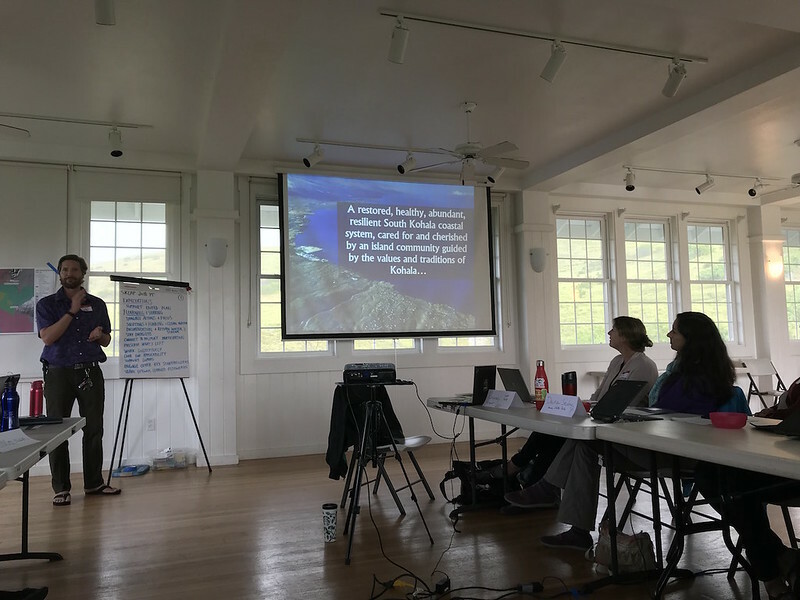 Using climate change as a framework to update the South Kohala Conservation Action Plan, an effort that started in 2010, the workshop pinpointed six major climate threats that could have a big impact for South Kohala’s coastal and marine resources. Teams discuss their rationales behind ranking certain threats higher than others. On the last day, teams shared their climate action ideas including coastal policy changes and reforestation strategies. What are those major threats? Warming of ocean temperature, sea level rise, ocean acidification, reduced rainfall, increased storms, and…you guessed it, more frequent and damaging wildfires. HWMO was invited to speak on the first day to talk about the mauka to makai effects of wildfire: fires in South Kohala have notoriously led to large erosion / flooding events (check out our video on the Kawaihae Fire and Floods for more information). Post-fire sediment that is carried out to the ocean can be detrimental to coral reefs and all who live off of them, including fish and us humans. View of Kohala Mountain and the watersheds that connect the vulnerable forests with the sensitive coastlines. Chad Wiggins of TNC points out mauka to makai connections, while we look out from the ocean towards the coast. Due to increasing conditions that are ripe for more frequent and severe wildfires in South Kohala, including warmer temperatures, decreasing annual rainfall, and increasing consecutive dry days, we could be in for more destructive land based pollution events that destroy reefs. This goes hand in hand with the scientific predictions of increased storms in Hawaii, which, after a wildfire, can make matters a whole lot worse for erosion and sedimentation and thus for our coastal and marine ecosystems. Check out our infographic on climate change’s impacts on wildfire for more information. On the 2nd day of the workshop, we were part of a “mauka” breakout group where we ranked the threats of fire, storms, and reduced rainfall as contributors of coastal and marine impacts. Fire repeatedly came up as a major threat that needed to be addressed seriously in South Kohala. In order to think BIG about action planning for South Kohala, workshop attendees were invited to join in on an afternoon of sailing from Kawaihae Harbor to Puako. The sailboat was graciously donated by Maile Charters for the purpose of building stronger connections between the various agencies and organizations involved with SKCP and to look at the connectedness of South Kohala from the vantage point of being on the water. As an added bonus, whales and dolphins frequently visited the boat and we were able to swim around Puako’s reefs to experience the beautiful coral and marine life that are critical to the health of our ecosystems and communities. Before an epic sunset, HWMO’s Community Outreach Coordinator, Pablo Beimler, performed spoken word about the Hokulea’s important message that we need to work together as one “Island Earth” and work with Mother Nature rather than against her. Setting sails for an adventure experienced by various SKCP partners. Sunsets and whales an added bonus. The final day of the workshop revolved around finding solutions. Breakout groups developed actions that could improve coastal health and reduce climate threats. Pablo shared HWMO’s vision of having communities be buffered by native and Firewise living fuelbreaks, which would also help bring communities together. Better water management and increased water resources was also a key discussion and was ranked very high by the entire group as an important next step for South Kohala. In another smaller breakout group, TNC’s Chad Wiggins, Hawaii State Parks’ Dena Sedar, and Pablo brainstormed ideas to reforest South Kohala (ranked highly as an important next step) with the intention of reducing wildfire threats, increasing watershed health, and improving community engagement, livelihoods, and employment/career opportunities. The planning area and what is at stake. Working together is the only path forward to build climate resilience. After three days with so many enthusiastic, positive, intelligent, and conservation-minded folks, we feel more determined to continue the important work we are doing to make South Kohala a more vibrant area, even in the face of worrying climate predictions. We are more resilient when we work together and that is a major reason why the South Kohala Coastal Partnership exists and is taking on this climate action planning process. We are extremely grateful for being a part of this partnership and look forward to collaborate with all involved to ensure our coastal areas, cultural resources, landscapes, and communities are safe from or adapted to climate impacts such as wildfire. Thank you to The Nature Conservancy, NOAA National Centers for Coastal Ocean Science, and South Kohala Coastal Partnership for inviting us to be a part of this monumental effort!